This book provides an overview of the youth population and the increasing complexity of transitioning to adulthood for all adolescents. For vulnerable (or "at-risk") youth, the transition to adulthood is complicated by a number of challenges, including family conflict or abandonment and obstacles to securing employment that provides adequate wages and health insurance. These youth may be prone to outcomes that have negative consequences for their future development as responsible, self-sufficient adults. Risk outcomes include teenage parenthood, homelessness, drug abuse, delinquency, physical and sexual abuse, and school dropout. Detachment from the labour market and school or disconnectedness, may be the single strongest indicator that causes such an unsuccessful transition to adulthood. 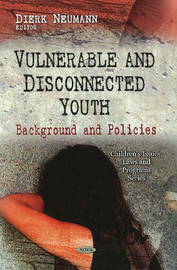 It also provides a separate discussion of the concept of "disconnectedness", as well as the protective factors youth can develop during childhood and adolescence that can mitigate poor outcomes. Further, the report describes the evolution of federal youth policy, focusing on three time periods, and provides a brief overview of current federal programs targeted at vulnerable youth.